Hiram visits North Kent Masters Lodge No 9062 at the Dartford Masonic Centre, on the 15th September 2017. 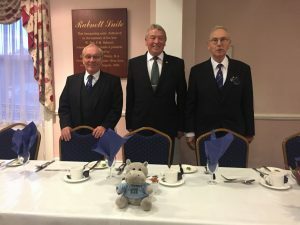 Following Hiram’s last visit to a regular lodge at Prudence and Concord in Welling, Hiram managed an outing to the North Kent Master’s Lodge at Dartford. Hiram and the presentation team were greeted by the lodge secretary and the Master prior to the meeting and made to feel very welcome. The lodge was opened at 5.00pm by the Master W.Bro. Douglas Hughes and his team of officers. Following a number of administrative issues dealt with by the lodge, the team gave their presentation to the members and guests assembled. The presentation which lasts around 30 minutes, is on The Kent Masonic Museum and Library entitled “The Past Present and the Future”, which was very well received by all present. Following this presentation, W.Bros. Phil Moore and Graham Stanford answered a number of thought provoking questions and took away a couple they could not answer to seek guidance from the Museum and Library. As readers who are following Hiram’s tour will know, the lecture covers the historic creation and operation of the library and museum. It traces the work involved in the recent development of both the exterior and the interior layout of the museum, before looking towards the trust’s future objectives. The masonic festive board was, as usual very enjoyable, where Hiram made himself better acquainted with the Master and his wardens as shown in the accompanying photo. During the festive board, the lodge made a donation to the Museum and Library of £100 for the presentation and members purchased a number of books that accompany the lecture, which has already been passed onto the Museum and Library trust. To date the West Kent tour has raised over £1750 for the Trust, which is a combination of donations from the units where the lecture is delivered and the balance through the sale of the accompanying books. Hiram’s top has now been inscribed with North Kent Masters’ name and lodge number, any unit wishing to receive the lecture and have their unit’s name and number added to Hiram’s top should contact Graham or Phil to get a date in their diary. Photo shows Hiram with W.Bros. Douglas Hughes, Ray Kenyon and David James at the festive board.